Do you want to improve your Pinterest presence? Have you ever thought to yourself that it would be nice to appear high up on a Pinterest search? Well, what if I told you that it was possible? Yep. You read that right. You can appear high in a Pinterest search so that you are more likely to be found. Well, it all comes down to proper keyword research. And we talked about this a little bit when we discussed Pinterest SEO. But I specifically want to talk about everything you need to know about keyword research on Pinterest in this blog post. If you are new to the blogging or digital marketing world, then you may be wondering what the heck keyword research even is. And I get it. I was there a couple years ago as well. When you go to search for something on Google or Pinterest, you are typing in certain keywords. So let’s say you want to find a healthy dinner recipe. The results that come up are based on the use of that keyword in their page title, description, and actual content on the page. Everything on search engines comes back to keywords. It’s really the center of everything. So if you want to appear in search, and increase your visibility online, then you need to learn how to perform keyword research and how to properly place them. And that’s exactly what this post is going to do (specifically talking about Pinterest). It’s simple actually. But it wasn’t always. Keywords were used as a trigger. The more keywords you had on your page, the higher you appeared in search. Well, over time, you can imagine that what people were included on their website was jibberish! Because they were just keyword stuffing and repeating the same information over and over again. So today, it’s a little different. Each blog post and page you write for your website should have a focus keyword in mind. This keyword should appear in the title of the page, the meta description, the alt text of images, and at least 3 times in the content. But it even gets more advanced than that. You need to also include other relative keywords in your content as well. So if you want to appear for “healthy dinner recipe”, you might also include “healthy eating”, “healthy recipe”, “late night dinner”, “dinner for 2”, and the list goes on and on. Now don’t get in your head thinking this is too complicated! Because it’s really not. When you write naturally, these phrases will automatically pop up without you even thinking about it. So place this thought on the back burner. And if you notice that your keywords aren’t performing well, then this might be an area of your content that you want to evaluate. But what I’m getting at here, is that what keywords you include in all elements of your page are the keywords that you are likely to appear for. Google and Pinterest will pull these out and rank you accordingly. There are several other things that go into your ranking on Pinterest, like the number of repins and the overall quality of the pin and website. 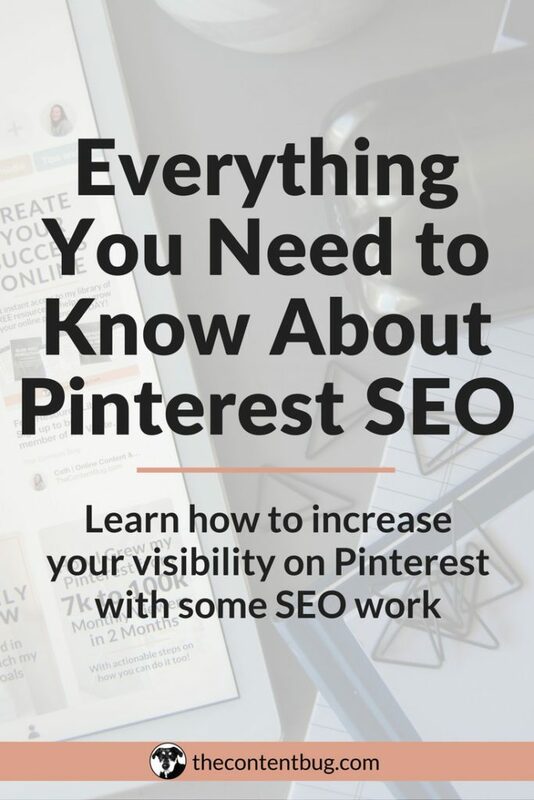 If you want to learn more about that, then you need to learn Pinterest SEO! Now, this is where things get fun. You already know what keywords are and how they work. And I even gave you a little advice on where to place them and how to use them. But before we dive more into the implementation, let’s talk about how to find the keywords that you want to include in the pages you pin on Pinterest. For the most part, I’m going to guess that you are looking to pin blog posts. Am I right? Well, I hope so because that’s what we’re going to focus on. But this information applies to any page that you pin to Pinterest. Unlike Google, who has several tools that can be used to perform keyword research, the best way to find keywords on Pinterest is to go straight to the source: PINTEREST! 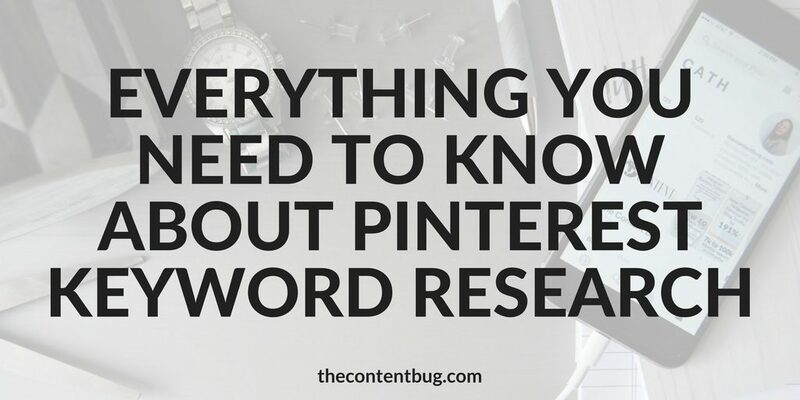 So start your research on the Pinterest search bar. And start typing in some simple keywords that describe your blog. If you are a food blogger, these keywords could be “dinner recipes”, “tasty treats”, “comfort food”, “easy cooking”, or “party appetizers”. These 2-word keywords would be your starting point. So make a list of some 2-word keywords you think are relevant to your blog. Then start to search them on Pinterest. Now STOP. You need to keep reading to learn what to do next. When you type something into a Pinterest search, a drop down will appear with 5 recommendations. These recommendations are based on what people typically search on Pinterest. Meaning they are highly searched items and would great to appear for in search! At this point, you can start taking note of what keywords you might want to include. But before you select any of those ideas, just click enter to search for the original 2-word keyword you started with. This is the typical search results page that you get on Pinterest. But have you ever noticed the section at the top that has a bunch of different words that you can select? These are recommendations to narrow down your keyword based on what people typically search for. So again, this is where you need to start thinking about your keyword research! Because these are keywords you can include on your site! PRO TIP: Focus on the long-tail keywords. To increase your chances of appearing higher up in search, you need to use some keywords that are used a little less often. And that means getting really specific! So try to focus on keywords that are 3+ words in length! You’ll see better results, guaranteed. If I lost you somewhere along the way, go ahead and watch this video. It will guide you through the exact steps you need to complete. Now that you’ve got your keywords. And you know what you need to include in future blog posts. It’s time to talk about what to do with those keywords. Because there are some specifics that you need to know! If you want to get your pins to appear for these keywords, then you need to SEO your pins! But before we get into the specifics of keyword placement, I want to remind you that Pinterest is an image based platform. People typically click on your pin because of the image. So it needs to be high quality! If your image isn’t high quality and doesn’t make someone want to click on it, then the problem is far beyond your keyword placement. I mean duh. This should be a no-brainer. But your keyword needs to appear in the title of your pin. If you are new to Pinterest, this title is automatically taken from the actual title of your blog post on your website. So make sure that it’s great from the very beginning. “How to” and list posts perform the best on Pinterest! Almost always. So if you are offering tips to people, I recommend focusing on those titles from the beginning. Just make sure that you are including your keywords naturally in your title. Have you ever noticed that pins have 2 descriptions these days? When I figured this out, I was so confused! But then I did some research and found a strategy that works. So I’m sharing that with you guys right now. The description of your pin is the information that is pulled from the alt text of the image that you share! This description can be changed to whatever you like. But this is really what’s going to impact what keywords you appear for. And this description needs to be really strong! In your description, you want to start with a couple questions to pull people in. Appear to their problems and include a variety of keywords that you think they would search for. Then got into what’s covered in your blog post. And again, include those darn keywords! You also want to make sure that the title of your blog post is in the description as well. Naturally weave it into what you’re talking about for the best results. And then include hashtags! Thank goodness Pinterest now uses hashtags because now you can flat out state the keywords that you want to appear for. So at the end of your blog post, include 2 or 3 hashtags that you would like to appear for. Hashtags work the same as they would on Twitter or Instagram. So be smart and include the keywords you REALLY want to appear for. Remember that 2 description thing I was talking about? Well, the section description is actually pulled from the first few sentences of your blog post. So yep… The first thing that you write on your blog post is important! And you don’t want it to say “this post contains affiliate links”. You can kiss your readers goodbye! This section needs to include your keywords as well. But in a natural way. I can’t say that enough! I recommend starting your blog posts with a story or with some questions. Engaging your audience from the very beginning will help your blog succeed in a variety of different ways. Now that you know how to use keywords to improve the visibility of your pins, let’s take it a step further. 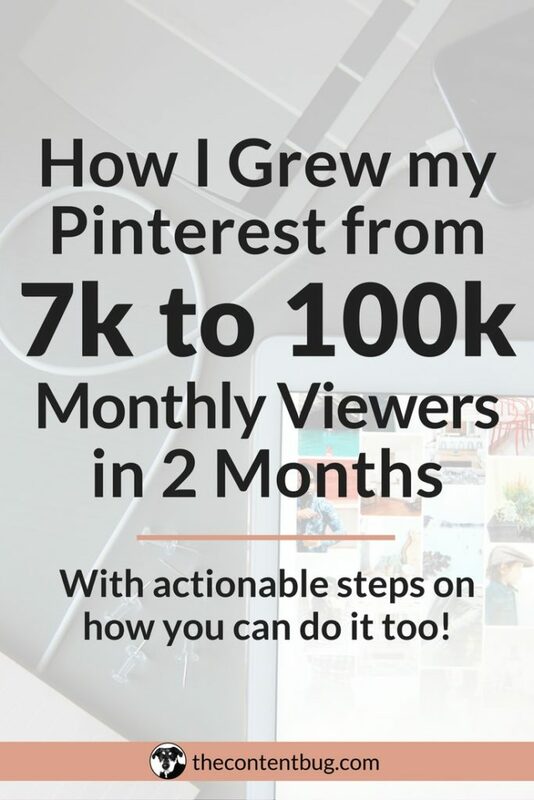 If you want to ROCK your Pinterest presence and skyrocket the number of monthly viewers you get, then you need to place the right keywords throughout your Pinterest profile. 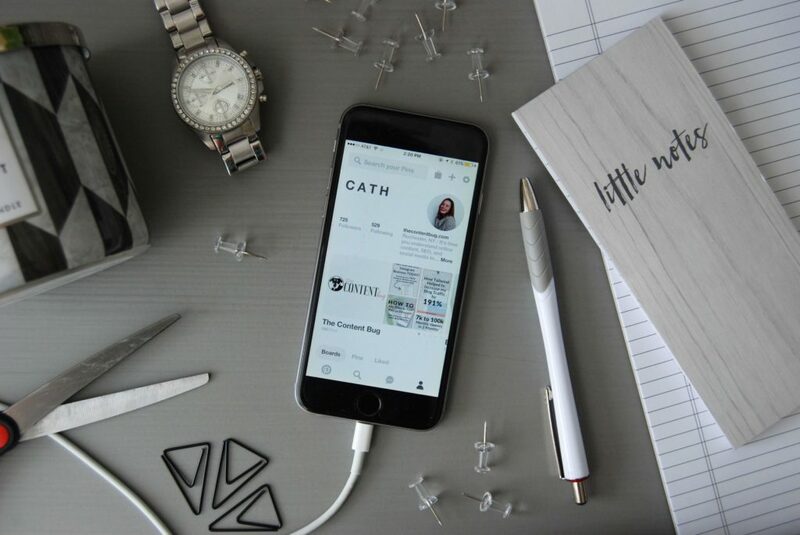 The name that you give your Pinterest profile is extremely important! You can’t just have your name or the title of your blog. You need to specifically include keywords that you want to appear for! So let’s take a look at mine for example. This was my account name a few months back when I wanted to appear for content and SEO. Those were my 2 specialties. And they still are… my direction has just changed a little bit. And here’s my account today. Since my direction changed, I decided to change my name on Pinterest as well. This time, I decided to include the name of my blog because I want my profile to appear when people search for me! Not just my pins. Also, I changed my focus keywords from “online content & SEO” to “blogging tips for online entrepreneurs”. Now I’m still not sure if that’s the best keyword phrase for what I do. So I might try a few different things over the next few months and see what works. But that’s the perk of Pinterest! You can do this! You can change your name as much as you like until you get it just right. So if the first keyword you pick is not performing well, you can change it! Just make sure that you include at least your name and then 1 or 2 keywords that accurately represent what you do! I’m starting to feel like a broken record. But your account description should include keywords as well. They are a little bit different. Actually, they are a lot a bit different. But they both contain 3 important keywords. YEAH, 3! Don’t be afraid to include more than 1 keyword in your description. As long as it’s relevant and it flows naturally in context, then you’re doing just fine! Think of your boards as your proof. You’ve talked the talk and told Pinterest, and it’s users, what you focus on. But now it’s time to prove that you aren’t lying! Your boards should include important keywords that you reference on your website. So let’s go back to that food blogger again. They could have boards on their Pinterest account for dinner, dessert, 30 minutes meals, brunch recipes, gluten-free options, and more! But what they don’t want to do is include a board that says “yummy yummy”. So use the title of your boards to accurately describe what’s included and use it as another opportunity to appear in a keyword search! Okay, I swear I’m about ready to wrap up this post! But man, oh man there is a lot of information to cover within Pinterest! Have you ever paid attention to the description of your boards? Well, you should. This is another opportunity for you to improve your Pinterest SEO and increase your visibility. And every one of your boards should have a description. I know I told you before the keyword stuffing is bad. But for some reason, people still get away with it on Pinterest! LIKE HOW?! If you read other articles, they will tell you to include a list of all relevant keywords in the description of your boards. And it’s true. You can do it. But I honestly think that Pinterest is going to catch on sometime soon and start knocking down boards that do this. So I try to use more of a natural approach most of the time. Just like everything else we’ve done, I think it’s important to use natural language while getting good use out of your keywords. So in the description of your boards, write 2 or 3 sentences describing what’s included. But again (broken record much), make sure you use your keywords! If you don’t use the research, then you won’t appear as well in search. If you really want your pin to appear in a Pinterest search, there are a few other things you have to worry about. You need to make sure that you have a business account, that you have rich pins set up, and that your pins are actually high quality! And then you can worry about everything we talked about above. So let’s wrap it up into a simple checklist that you need to complete for proper Pinterest keyword research! 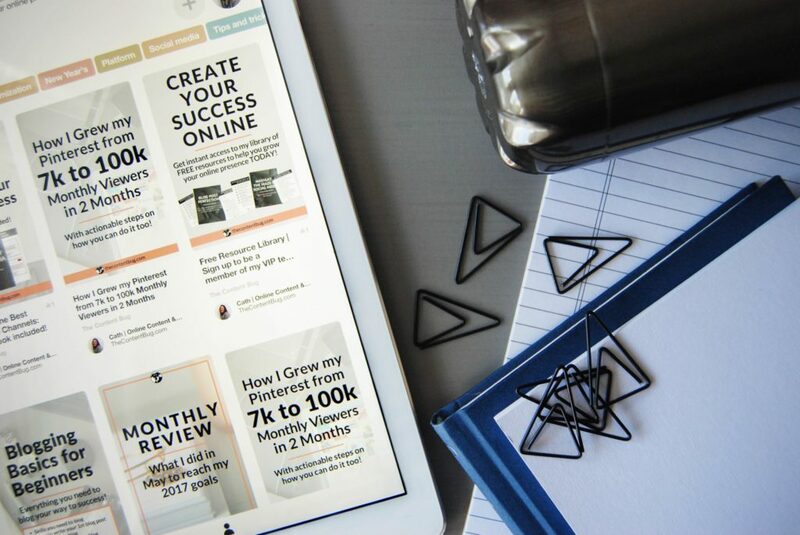 Absolutely crush your Pinterest strategy and get more leads than ever before! AHHH! This strategy works. And if you don’t believe me… let me show you! I started to SEO my Pinterest account back in March. And by the time it was May, I noticed a huge difference in my Pinterest traffic and growth. So I wrote a blog post about how I transformed my monthly viewers from 7k to 100k in just 2 months. And that blog post took off! 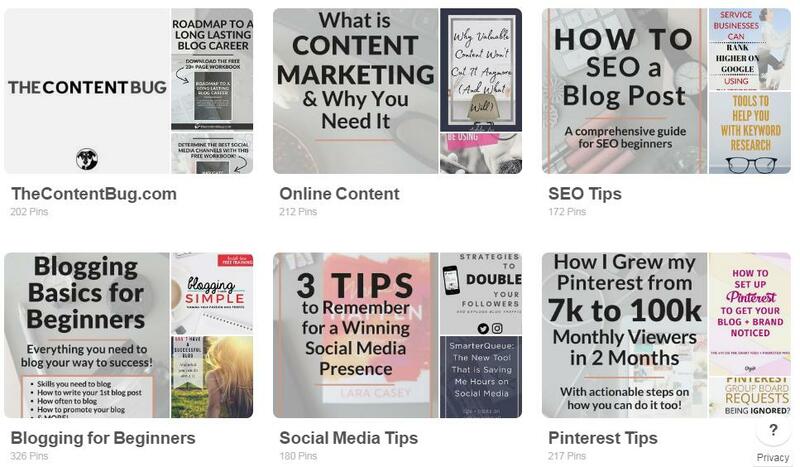 Because there are some real strategies in there about how to grow you Pinterest. Then I tanked my account to become more niche specific. And after a few months, my account skyrocketed! All because of these keyword strategies and Tailwind Tribes, really. 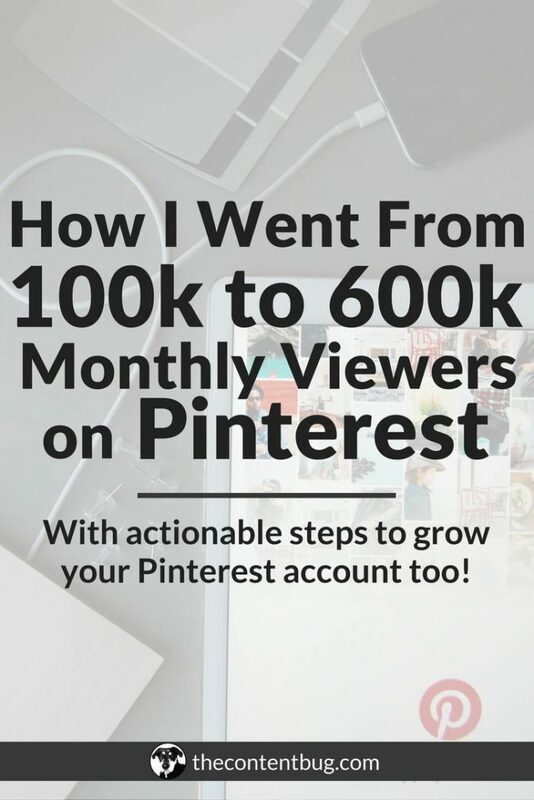 I ended up reaching over 600k monthly viewers on Pinterest. And now I’m averaging 500k monthly viewers on Pinterest! Still don’t believe me? Well, goodness. You need to have a little faith but okay. Here’s a picture to prove it! 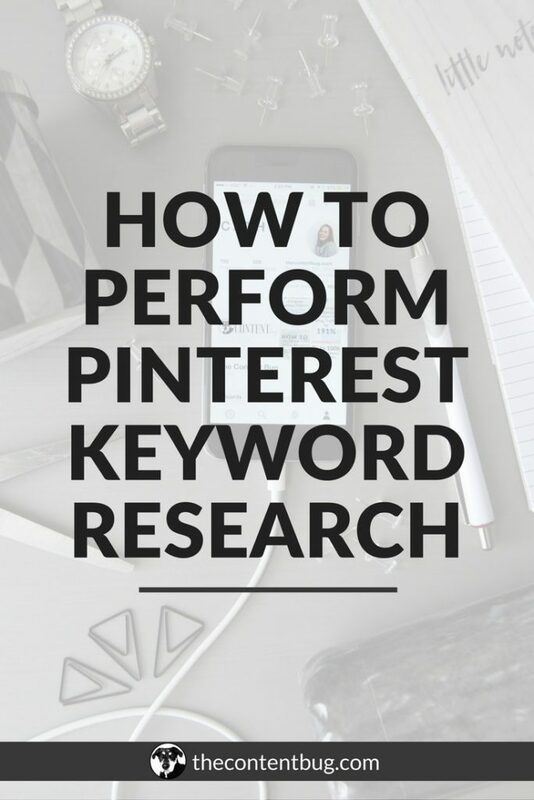 So try this Pinterest keyword research strategy out, and let me know how it works for you! I would love to see your results. And if you do anything different that you notice helped to grow your Pinterest, let me know in the comments below! I’d love to feature you! Does your Pinterest strategy seem a little outdated? Are you constantly wondering if you’re doing things right or if you’re doing them wrong? Let me perform an evaluation on your Pinterest profile and current strategy to see how you can improve! Find out more information here and then email me at thecontentbug@gmail.com to get started! Thank you for all the tips. In the last week I’ve managed to increase our Monthly Viewers from 49k to 174k. I’m planning to start implementing the keyword research and join group boards to try and get up to the 600k mark. I love to hear when people see results, especially that quickly! Keep up the good work and keep me updated on your Pinterest growth as it continues to improve! Excellent article. Thanks for sharing such a helpful list of keywords research tools. Google Keyword Planner and SEMRush are two my most favorite keywords research tools. Finding the most profitable keyword is really easy if you have these tools.